After a week on the job, I am exhilarated and exhausted. Sometimes I sort through a lot of paperwork. Sometimes I taste a lot of wine at 8 am. This industry is truly foreign to me, so retaining it all feels like doing sudoku or calculus and other things that don’t come naturally to me. When I start to feel guilty about how much hand-holding I need right now, I take solace in the fact that the winemaker, Tyler, hired me despite knowing he was going to have to build me up from nothing like some Olympic gymnast from the USSR. On my first day on the job, I went out to a few vineyards that the winery works with. I once assumed that winery and vineyard were synonymous terms. They aren’t. Growing up, my chief exposure to the concept of a winery was – honestly – from the movie The Parent Trap. The remake. Whose opening credits include “Introducing Lindsay Lohan.” I know this because I just recently revisited this national treasure. In the movie, Dennis Quaid is super rich and suave and makes wine. He does this from a palatial home and a sultry cellar surrounded by lush vineyards, accessible via golf cart and horseback. These places exist. They dot this extensive region as they do places with even older wine industries. Like, um, France. And Italy. But I was surprised to learn that these estate wineries only represent a fraction of the business. There is a wide variety of wineries. “My” winery, Donelan Wines, is a “boutique winery” that produces small amounts of fairly expensive and highly-rated wines; we have a facility for making the wine but we buy our grapes from growers. The growers own the land and the grapes and hire vineyard managers – or do it themselves – who work in conjunction with the winemakers who will buy the grapes. The winemaker pays close attention to what’s happening in the vineyard, making tactical requests based on winemaking philosophy and the goals for the season or the product. It’s up to the manager to get it done: hire a team, get the equipment, etc. In the vineyards, Tyler pointed out differences in varietals; a healthy Pinot cluster looks like a small, green fist at this stage. All vineyards once looked the same to me – long rows of green stuff – but there’s a lot to notice. Where the weeds are growing high, there’s been a lot of moisture, and the grasses can be tended in ways that control the growth of the fruit. The vines can be encouraged to grow in a lot of different ways: some are cut closely and squared, some billow into “canopies” up top, others are squat or branchy . 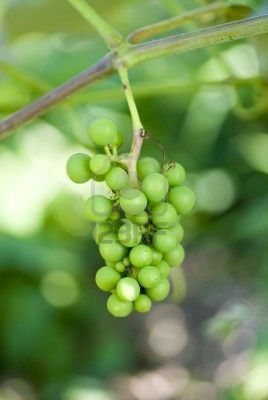 . . all of these will affect the way the fruit ripens. At one of the vineyards, we went up an intensely steep hill. 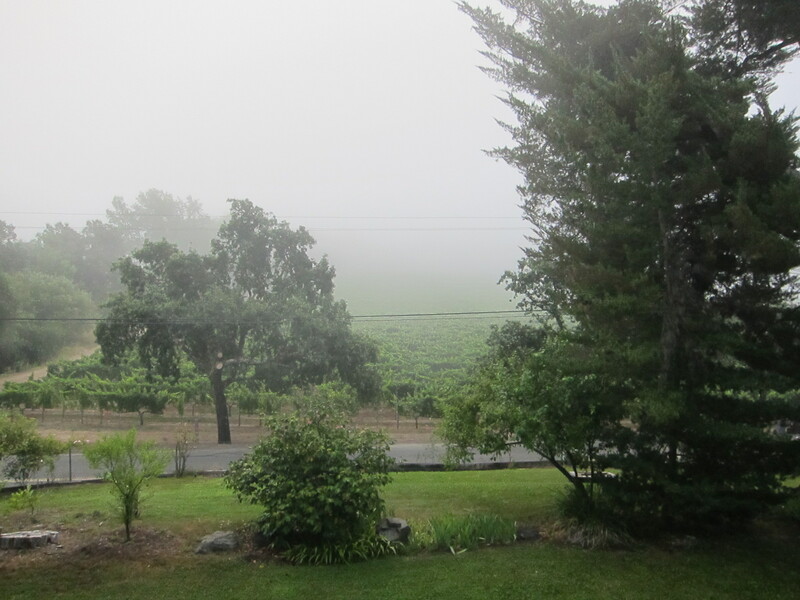 The morning fog was still sitting low, and we were soaking wet from tromping through grasses and vines. My little hipster shoes clung to the chalky dirt and I could feel the electrical tape holding them together peeling off. We had an amazing view from the top, from where we could see how different parts of the vineyard were growing more or less amply, which will influence harvest strategies. I was trying to concentrate, but I was distracted by how beautiful everything was, and how hard it is to find appropriate footwear for this job. And then I thought, of course. I was raised by people who figured out how to read and write for a living. And that’s mostly what I’ve done with my life so far. Someone who studies and makes wine will always approach wine with the thoughtfulness of someone who studies and makes wine, just as someone who studies and makes literature or food or window frames will. It’s just a different vocabulary, and I’m still learning the alphabet. And this world does overlap with the one I’ve just come from, sometimes in surprising ways. Since I’ve been here, I’ve met a handful of people who know Smith or Northampton somehow. One winery’s newsletter quoted the opening lines of T.S. Eliot’s The Waste Land: “April is the cruelest month. . .” An odd choice given the context, if you ask me, but I know the words so well that seeing them gave me a jolt, like running into an old friend. At work, each of the two single-occupancy restrooms has one lonely book sitting on an otherwise empty shelf: The Best American Short Stories 1945, and An Anthology of Famous English and American Poetry. What? 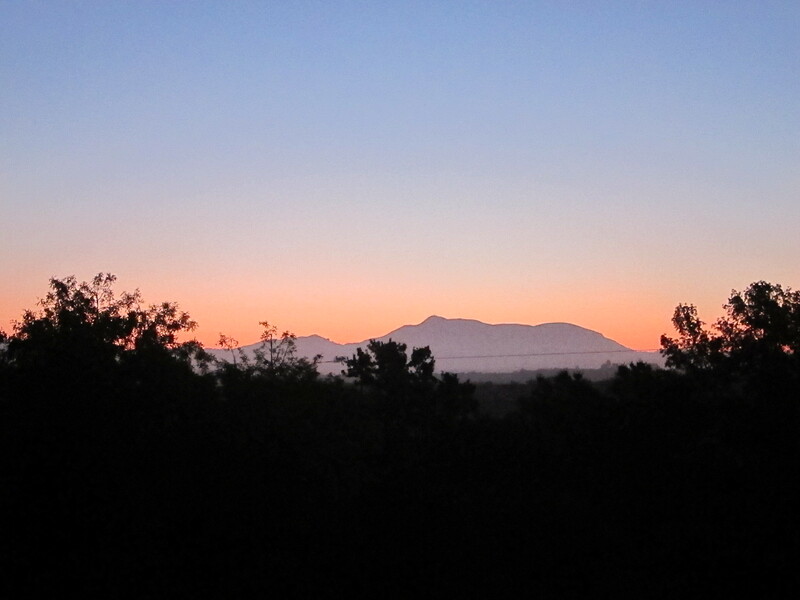 I’ll be seeing a lot more sunrises soon. Send for help.